Posted on June 15, 2017	by H.P. 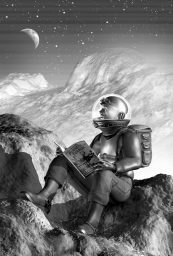 My original concept for Throwback SF Thursday was less #PulpRevolution and more a mix of Vintage SF (including Campbellian science fiction) and modern fiction that is self-consciously retro. Maybe it’s Cirsova Magazine or maybe it’s . . . Slaves of the Switchboard of Doom. Slaves of the Switchboard of Doom: A Novel of Retropolis is one of those self-consciously retro works that pokes fun at the source material. But don’t get the wrong idea. This is entirely done from love. Schenck takes the 1939 World’s Fair vision of the future and the pulps and runs with it, having a hell of a lot of fun in the process, if not quite telling a pulp tale. We are immediately introduced to our hero, Kelvin Kent. Better known as Dash. Or occasional Kelvin Dashkent. He parks his rocket on Luna, disables a couple adepts of the Spider God, evades their traps, and rescues the princess. Well, Princess. Princess the Cat. Hey, everybody has to start out at Level 1. Dash picked up his adventuring skills testing out the ideas from stories submitted to his father’s magazine. Old Man Kent was the sort of pedant who didn’t want anything in his stories that wasn’t plausible (anti-Campbellians may boo and hiss at this point in the review). Catting around doesn’t make for much of an adventure (at least since the death of the left-hand novel), but lucky for Dash, bigger and more Level 2 things are on his horizon. Ok, pause for a little scene setting. As I mentioned above, Slaves of the Switchboard of Doom is set in a world inspired by a 1939 speculative view of the world. Specifically set in Retropolis, a vaguely located megacity. Where people travel pneumatic tubes and monorails, the science fiction of tomorrow available today in Morgantown, West Virginia. A wee spot of inertium—raw ore mined from asteroids, a lighter than air metal—allows for hover cars and personal rockets. (Leaving the ground level blessedly clear for pedestrians.) An entire district is given over to “Science” (capitalized always), practiced entirely by mad scientists. There is televideo and InfoSlates, but both only work with the help of switchboard operators. Which is how Dash gets his next job. It seems that after a bit of observation by Howard Pitt, a Robert Moses-type and civil engineer and efficiency expert, the switchboard operators have been found to be entirely redundant. Like any good efficiency expert, he is the villain. They pool their resources to hire Dash to get to the bottom of just how they were replaced. That is the first of three main mystery threads. Contemporaneously, Abner Perkins discovers that Retropolis supplies of Inertium are negligible due to a series of mysterious purchases. Harry Roy begins investigating a robot left in an alleyway. A robot built with no legs. 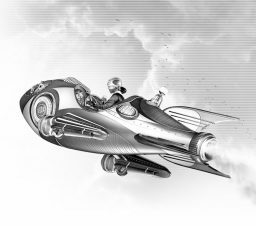 A bit about the robots of Retropolis. This is a world without computing, or even robots, in the modern sense. Everything has to be done by hand, even if that hand is robotic. Robots are sapient, and there is broad agreement that there are ethical and legal obligations that come with that. They vary in form, but uniformly robots are manufactured and sold under an indenture. They then work off their indenture for their owner (whose purchase price of course financed the manufacture of the robot) until, at the end, they become free. Where it goes from there you can guess if you know anything about the economics of indentures. You quickly wind up with a lot more free robots than indentured. Schenck’s take on robots is one of the highlights of the book. It’s a vision of robots as working class, blue collar laborers rather than a reflection of rather more elite science fiction writers. This, too, is in keeping with the pulps, which were much more working class and blue collar oriented than modern SF, being written in a time when people read more and far more of America was working class and blue collar. It also allows for a lot of fun within the story, but I will leave that for the converts. I have neglected a rather important point. The switchboard operator deputized to hire Dash is Nola. She serves as his feminine foil throughout. She lacks Dash’s skills, but like any good woman, she provides common sense, grounding, and encouragement for Dash. Not to mention grit and pure gall. Heaven help the enemy facing a hero backed by a good woman. Slaves of the Switchboard of Doom is enormously funny. It pokes fun at its pulp roots. But where it really shines is skewering the more normal side of life, whether it be returning a damaged and warrantied piece of space equipment or dealing with robot middle management. It reminds me of Larry Correia’s Tom Stranger in this, albeit toned way down. This sort of madcap book, juggling multiple plot threads that all need to come together in the climax, is very difficult to pull off. Richard Kadrey’s The Everything Box is virtuoso in doing so and was one of my favorite books of 2016. The follow-up, The Wrong Dead Guy, was an enormous disappointment in comparison. Slaves of the Switchboard of Doom splits the different, albeit leaning toward the former. The pace is suitably pulp-like at the beginning but loses focus a bit once all of the plot tops have been set spinning. It would have perhaps been better served by a shorter book, but Schenck would not have been able to juggle quite so many plot threads. Those also take away from Dash and Nola, who are the real heart of the story. This is a quite funny book with a solid mystery at its heart and solid action, but all of those are in some tension with the others and none manage to be great, rather than just good. Still, this book is a lot of fun and well worth picking up if it sounds like something up your alley. Slaves of the Switchboard of Doom is billed as including illustrations also by Schenck but they aren’t in my advance copy (I’ve included a couple I pulled from online above). I’m not really a fan of the cover art, especially as a representation of the book. But I can’t hate on anything that so strongly recalls ReBoot. Avalinah on Slaves of the Switchboard of Doom at Avalinah’s Books. Nicole Hill on Slaves of the Switchboard of Doom at the B&N Sci-Fi and Fantasy blog. 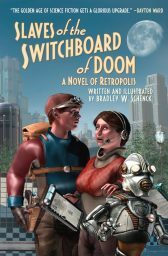 Throwback SF Thursday: Slaves of the Switchboard of Doom by Bradley Schenck was originally published at the Castalia House Blog. This entry was posted in Book Reviews, Science Fiction, Throwback SF and tagged Raygun Romance, Retro SF, Tor/Forge. Bookmark the permalink. Oh, cool! And you liked it as well! I’m very glad, and thanks for linking me up as well. Do you have any recs for similar books? I haven’t read anything like this, I’m afraid, but I’d love to read some similar books. Also, i didn’t know the real one had illustrations. Anyway, nice review! I like the way you point out its similarity to pulp and some other books – that’s what I sort of wanted to say, but couldn’t really find a way to say. I’ve never read anything quite like it. The Everything Box has that same sort of crazy, madcap story, and is very funny, but in an urban fantasy setting. Tom Stranger, Interdimensional Insurance Agent pokes great fun at middle management and bureaucracy, but there isn’t much of a story and it is heavy on inside jokes. Futurama borrowed very heavily from the same sources as Schenck, and of course is very funny. The cover art reminds me a lot of ReBoot, but the allusions there were heavily titled toward early computer culture. Allen Steele wrote a couple modern takes on Captain Future. I understand his first effort, The Death of Captain Future, is more satirical and his effort from this year, Avengers of the Moon, is more straight up. But I haven’t read either. Dang. Now you make me regret that one time the Everything Box was on huge sale and I DIDN’T get it. Ughhh!